We didn't celebrate Halloween over here in the UK when I was a child, or even when my own children were growing up but now it is quite a big event in our calendar. I had to search for what I had to meet this challenge and ended up using an embossing folder of trees which I highlighted with some coppery gilding wax. Then I made my pumpkin out of some very old Spellbinders flower dies I cut it out 8 times and folded each one across the centre then stuck them back to back to form a little 3D pumpkin, added some lime green vine leaves, I cut some extra vines to twist through the die cut letters. It was all assembled but something was missing ..... googly eyes ..... I searched and searched but couldn't find them I think my grandchildren must have used them up years ago when we used to craft together, such Happy Days. I was just about to give up on the idea when I found a box of sequins and decided I could make spooky eyes peeping out of the darkness with them. So I hope this is spooky enough, it would certainly scare me seeing all those eyes glowing in the dark behind the trees. I hope you will join us in this challenge, it is really fun one, we really would love to see what Spooky means to you. Entering is easy details are here. This is SO COOL!! Love that pumpkin! Great Halloween card Annie! Have a great day/weekend! Hi there Annie...hope this finds you well!! 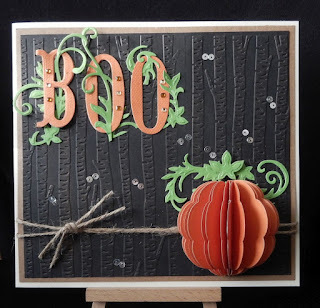 What a beautiful Halloween card...I love the way you've woven the vines through the letters! Have a most wonderful weekend Annie! I love how you created your own honeycomb pumpkin!